In South Seattle, the ghosts are stirring along the Duwamish. Yes ghosts. The ghosts of all those almost seven thousand Boeing B-17 bombers which brought the Nazis to their knees, and the 277 B-52 bombers which helped turn the tide in the Cold War. 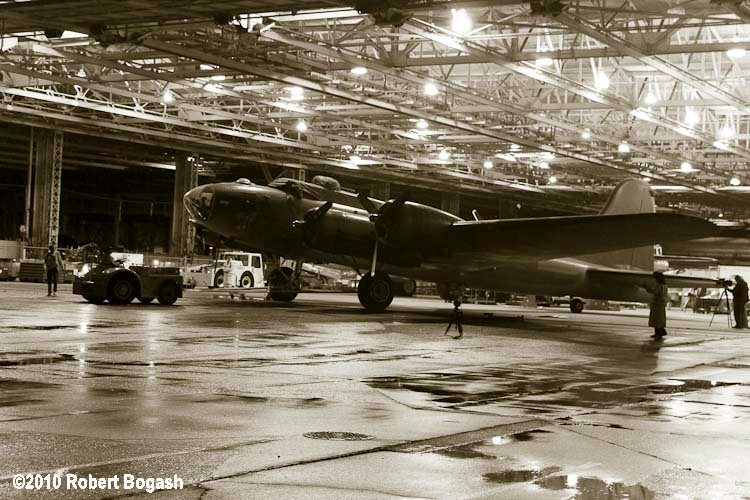 They are losing their birthplace, as Boeing has decided to demolish its venerable Plant 2 airplane factory, where these B-17 and B-52 warplanes were produced in incredible quantities. When I first visited Plant 2 in mid 1950, the wartime production of B-17 bombers, which actually reached 16 per day…every day, had long ceased, the camouflage village erected on the roof to confuse Japanese bombers had been removed, and the metal jigs and fixtures used to produce the planes, had been cut up and sold for scrap. The only remaining evidence of this mighty production effort were the thousands of nuts, bolts and rivets embedded in the plant’s asphalt aisles, and the scars, dents and embedded metal in the maple floors of the balcony, where the smaller pieces of airplane had been assembled. In fact, you could shoot a cannon down any of the main aisles with no fear of hitting anyone or anything. But listening closely, one could imagine hearing the whine of the lathes and milling machines, and the thump of the presses, turning out the bits and pieces, and then the earsplitting clatter of rivet guns, wielded by hundreds of legendary “Rosie the Riveters”, assembling the parts into complete airplanes. And finally outside on the apron, the scream of the four big radial engines, as they were run up to full power, bringing the big “bird” to life, at last. But Plant 2 didn’t sleep for long. The Cold War was soon upon us, along with the B-52 bomber. That awesome machine, which is still in service, could carry an H bomb to anywhere in the Soviet Union. Thus threatening unimaginable devastation upon that Evil Empire. AAnd where was this monster built. You guessed it, Boeing Plant 2. The airplane could barely be contained inside the plant, and actually had to have the vertical tail folded down to clear the doors. But the other Boeing plants were full of priority work, so the old gal was again pressed into service. And serve she did, with 277 B-52s being built there in 8 years. But with the transfer of B-52 production to Wichita, the old lady, who by now was showing her age, again fell into disuse. Boeing had built a state of the art Developmental Center elsewhere, and modern plants for producing jetliners, were sprouting like weeds at the Boeing Renton site. She did have a bit of a reprieve though, when the first 8 737s were built there in 1966. That was a couple of years before I used part of this old factory to build and test a full scale seawater desalination plant. While at about the same time, some other guys were building asphalt processing plants elsewhere in the building. In recent years, however, the place has fallen into almost total disuse, with antique airplane storage and some Museum of Flight airplane restoration being the only significant activities. Somehow though, it doesn’t seem quite right to rip down this iconic structure, and recycle this irreplaceable bit of Seattle and airplane history into just another park. Or Heaven forbid, a Shopping Center. The last B-17 to roll out of Plant 2. No, not 1945, but September 2010. The airplane is a B-17 belonging to the Museum of Flight, which was stored in the building.